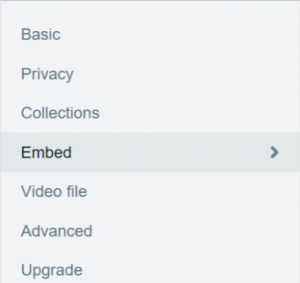 When you upload a video to Vimeo, you can then embed that video on your website, in emails, on Facebook, or elsewhere. 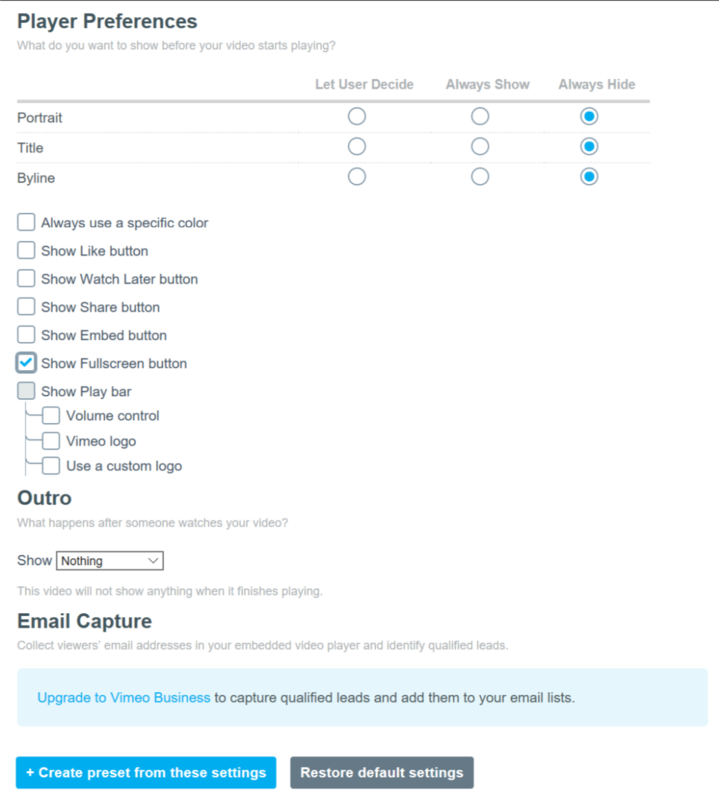 Not everyone likes the default settings for Vimeo's video player, though. If you don't either, here's how to make some changes. 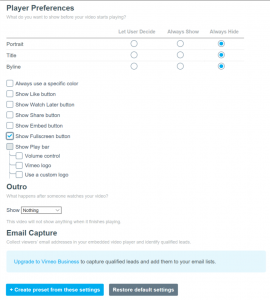 While logged in to your Vimeo account, browse to the page for your video. Beneath the title of the video, click on the “Settings” button that has a gear icon. If you don’t see this button, make sure that you’re logged into an account that has full editing permissions for the video. 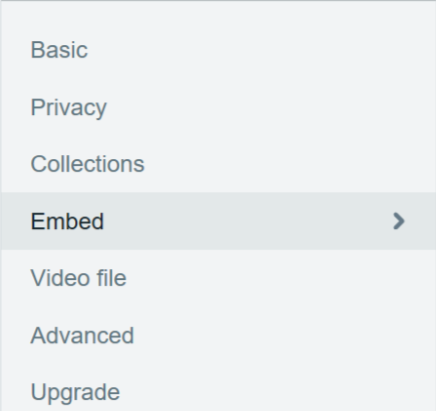 On the left side of the page, click on “Embed” in the settings navigation box. In the “Player Preferences” section, you can choose how you’d like the video player to look. This is the “profile picture” for the account the video is uploaded to. It appears in the top-left corner of the video player, left of the video title. This is the name of the video, created by you when uploading the video. This appears in the top-left corner of the video player. This is usually made up of “From: <Your Account Name>”, but not always. This appears in the top-left corner of the video player, just underneath the title. Here, you can customize the accent color used in different parts of the video player. It will affect the color of the Title, Byline, Like button when hovered over (if button is enabled), Watch Later button when hovered over (if button is enabled), Share button when hovered over (if button is enabled), Fullscreen button when hovered over (if button is enabled), Play button when hovered over, Volume Controls (if controls are enabled), and Vimeo logo when hovered over (if logo is enabled). This is the “heart” button at the top-right corner of the player. Clicking this button will allow viewers to add this video to their favorites list. It is part of a vertical row of buttons (along with the Watch Later and Share buttons). The order of these buttons depends on what you’ve decided to enable. This is the icon that looks like a clock in the top-right corner of the player. Clicking this button will add the video to a list of videos that your viewer has decided to come back and watch at another time. It is part of a vertical row of buttons (along with the Like and Share buttons). The order of these buttons depends on what you’ve decided to enable. This icon looks like a paper airplane. Clicking this button will allow your viewers to send a link to the video to their friends and family. It is part of a vertical row of buttons (along with the Like and Watch Later buttons). The order of these buttons depends on what you’ve decided to enable. This allows the viewer to make the video go fullscreen on their device. These controls allow the viewer to adjust the volume of the video. These controls appear in the Play bar (if Play bar is enabled), at the bottom of the video player. The Vimeo logo appears towards the right side of the Play bar (if Play bar is enabled), which in turn is at the bottom of the video player. This logo links to the video’s page on Vimeo.com (if your privacy settings allow the video to be listed on Vimeo.com). “Show logo during playback”: if selected, the custom logo will continue to appear in the bottom-right corner of the video player while the video is playing. If it is not selected, the custom logo will appear only until the viewer starts watching the video. “Link this logo to”: here you have the option to enter a URL of a webpage that the viewer will be taken to when they click on the custom logo.